So after 9 months(! ), I got a new haircut. 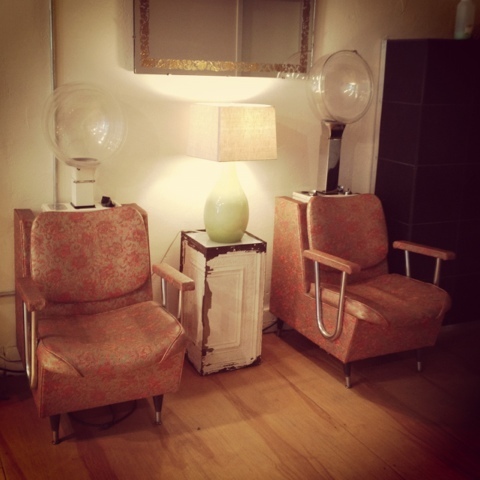 I won't even get into the details of how awful my hair was looking and will jump right to the reason for this post: beautiful vintage salon chairs! Apparently, the salon owner is a vintage lover and has many vintage items decorating the salon. These chairs work perfectly and are used daily to make client's hairs! How cool is that? I couldn't help but snap a picture of them to share here in the blog. Visit my shop at www.scavengenius.etsy.com! Fabulous chairs and such a charming atmosphere. Great mid century pieces. My salon also has similar chairs and I think they are fabulous. Way cool! That is so cool! Such a great color. I love my hair salon for its design and decor as well! Have seen one in a long time. The Salon owner has kept them in great condition despite being used daily. Nice Chair. This article is very much helpful for all users. The thoughts are very good. Thanks to sharing the great information….